Former India No. 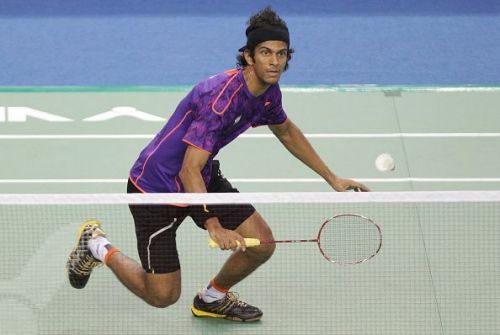 1 men's singles shuttler Ajay Jayaram had to work hard to make his way through to the second round of the Yonex Chinese Taipei Open 2018 in Taipei City on Wednesday. The 31-year-old dropped the first game but managed to rebound in the second, and then completely outplayed the 114th ranked Hashiru Shimono of Japan, 18-21, 21-17, 21-9 in this 58-minute battle. Russian Open winner Sourabh Verma joined him later in the day after winning a hard-fought first round contest against World No. 146 Chia Hao Lee. Interestingly, Jayaram's path has now opened up after the fall of a couple of seeds at this Super 300 tournament. The Mumbai shuttler had both the fourth seed Hsu Jen Hao and the seventh seed Lucas Corvee in his quarter of the draw but both of them crashed out on Day 2 of this competition. The World No. 58 Jayaram will thus have to take on the 75th ranked Kim Bruun for a place in the quarter-finals. The erstwhile World No. 13 is working his way back to the top echelons of the sport after having been on a hamstring injury-induced hiatus for a long time last year. Verma, who returned to winning ways in July from an ankle injury, struggled initially against his lower-ranked opponent. Having conceded the first game, he fought back to notch up an 18-21, 21-16, 21-13 win. Rahul Yadav Chittaboina had a hard time against the World No. 99 Lu Chia Hung of Chinese Taipei. The Indian bowed out with an 11-21, 9-21 loss in 32 minutes. Abhishek Yeligar was completely outplayed by the fifth seed Jan O Jorgensen 5-21, 6-21 in just 20 minutes. In the absence of the top shuttlers, the rising stars had participated at this tournament in women’s singles. But none of them could manage to earn a win. Sai Uttejitha Rao Chukka went down 15-21, 18-21 to Chiang Ying Li while Mugdha Agrey was no match for the seventh seed Soniia Cheah, who pummelled her 21-11, 21-4. Sri Krishna Priya Kudaravalli fought valiantly only to taste an agonizing 21-23, 20-22 defeat to World No. 142 Lin Ying Chun. In men’s doubles, Tarun Kona and Lim Khim Wah lost 13-21, 10-21 to the fourth seeds Ong Yew Sin and Teo Ee Yi.